Click to download the PDF report. SkyTruth, Oceana and Google have announced Global Fishing Watch, a big data technology platform that leverages satellite data to create the first global view of commercial fishing. 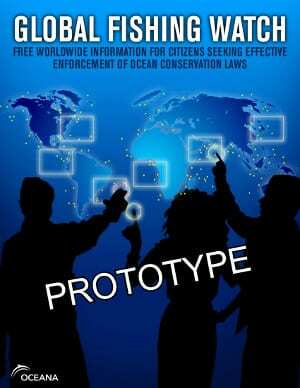 On November 14, 2014, a prototype was unveiled at the 2014 IUCN World Parks Congress in Sydney, Australia, with a public release version in development. Global Fishing Watch will ultimately give citizens a simple, online platform to visualize, track and share information about fishing activity worldwide. For more information, please visit GlobalFishingWatch.org. The Komarovo, a trawler registered in Russia, exhibited behavior that appears to be fishing five times inside the Dzhugdzhursky State Nature Reserve in September 2013. This vessel entered the Reserve and appeared to be fishing on at least 13 days in 2013. The manager and owner of the Komarovo is Voskhod Fishing Collective, and according to a Russian Business Database, the company is an industrial fishery for crabs and salmon. 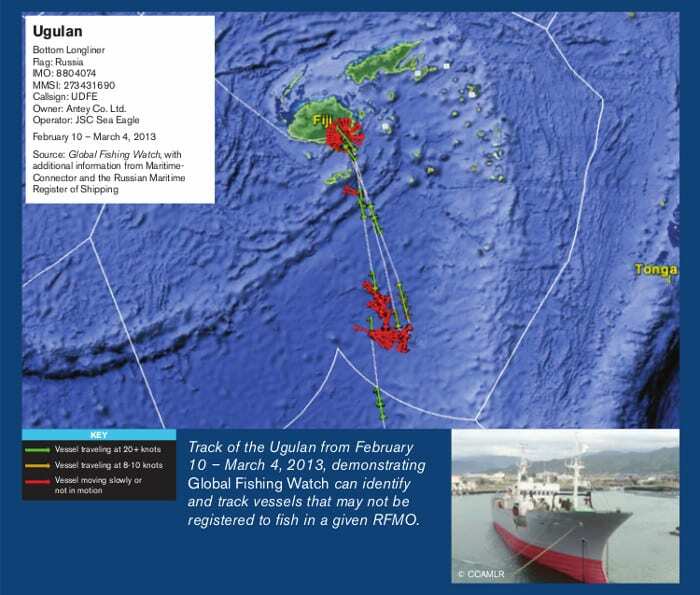 The Ugulan, a bottom longliner which was not on the registry of the Forum Fisheries Agency or the WCPFC, exhibited possible fishing behavior multiple times within the Fiji economic exclusive zone (EEZ). It first exhibited potential fishing behavior from February 10-13, 2013 on its way to Suva, Fiji where it stayed until March 1. On March 2, the Ugulan traveled back south to an area just east of where it had exhibited possible fishing behavior in February, and it appeared to fish again for another day and a half before traveling back to Suva on March 5 where it stayed until it left Fiji on March 15. It is likely that if the FFA were prompted by a message from an active citizen who used Global Fishing Watch to uncover the activities of the Ugulan, it would consider taking action to enforce its fishing licensing rules.